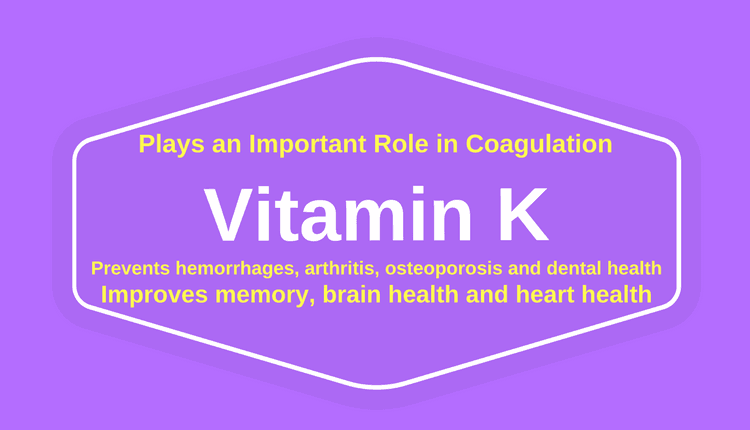 Vitamin K is a fat-soluble vitamin which has derived its name from the German word ‘Koagulation‘ which means ability to prevent hemorrhages and to clot blood in order to prevent excess bleeding. Vitamin K1- It is known as phylloquinone, the main dietary form of vitamin K present in green leafy vegetables. Vitamin K2- It is known as menaquinone, which is produced by the bacteria during fermentation. Among all three forms, vitamin K2 plays a huge role in the treatment and management of various diseases and disorders. Vitamin K3- It is known as menadione and it is the synthetic form of vitamin K.
A right balance in the intake of vitamin K and calcium may fight osteoporosis and prevent bone fractures. Vitamin K-dependent proteins activate osteocalcin, a compound which helps in binding calcium from the blood circulation to the bone matrix. It makes the skeleton stronger and less susceptible to fractures. For this entire process to take place, it is important to consume vitamin K-rich foods. Scientific research revealed that poor vitamin K and vitamin D nutritional status is associated with an increase in the systolic as well as diastolic blood pressure. It is found that vitamin K is not only important for bones, but this nutrient plays a vital role in protecting the brain and nervous system too. Vitamin K enhances the formation of sphingolipids in the brain, that play an important role in cell signaling and transmission. Evidence-based scientific studies have found that vitamin K is inversely associated with insulin resistance in older individuals. High intake of vitamin K-rich foods or supplements is linked to better glycemic control and improved insulin sensitivity. Vitamin K-dependent proteins boost the health of pancreatic beta-cells and improve insulin secretion. As insulin secretion is improved, the entry of glucose into the cells for the purpose of energy is enhanced and less of it remains in the blood. Thus, vitamin K helps in the management of blood glucose levels. Chronic inflammation is the cause of various diseases and disorders in humans. Inflammation damages your healthy cells and tissues and has a negative impact on overall health. Vitamin K intake along with anti-rheumatic drugs serve as a potential therapy in the treatment and management of arthritis. Studies have found that a deficiency of vitamin K is associated with an increase in the risk of developing knee osteoarthritis. Studies have reported that vitamin K has beneficial effects on the treatment and management of liver cancer. It suppresses the growth and spread of cancer tumor and cuts down the supply of blood to the tumor. Vitamin K strengthens the teeth by binding calcium from blood circulation to the teeth. A centrifugal fluid flow is controlled by the brain, which is required for healthy teeth. Oxidative stress and free radical attack can negatively affect the centrifugal fluid flow and cause tooth decay and pain. Vitamin K fights against oxidative stress and enhances the flow of centrifugal fluid. This fat-soluble vitamin further reduces the vulnerability of teeth to the bacteria and thus, protects them. Vitamin K improves salivary buffering and enhances re-mineralization of enamel.